Antioxidants in Chocolate - What are the Benefits of Dark Chocolate and Cocoa? Antioxidants in chocolate - now, isn't that good news for you chocolate lovers. Does that mean you can eat just any old chocolate bar and think you are doing something healthy for yourself? I wish! Dark chocolate and cocoa is derived from cocoa beans which are grown in pods on the cacao tree. Antioxidants in chocolate are from the cocoa beans. They are a rich source of natural antioxidants called flavonoids and phytochemicals called polyphenols. Flavonoids have many antioxidant properties. Would you believe that raw, organic cocoa powder is the best source for your antioxidants? It has a higher ORAC value than blueberries, goji berries and the acai berry - combined! 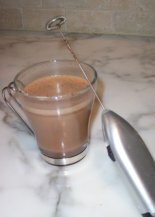 You may be surprised, as I was, that there are many health benefits to eating cocoa and dark chocolate. Here is the report of one study. Antioxidants combat and neutralize free radicals which cause damage to our cells, and in particular the macula where lots of oxidation takes place. Dr. Lylas G. Mogk, M. D., Visual Rehabilitation and Research Center of Michigan. The benefits of dark chocolate over milk chocolate, is that dark chocolate has higher amounts of antioxidants. Milk chocolate has the least amount of total antioxidant capacity. The richer in cocoa the better. Select chocolates with at least 70% cocoa content such as Green & Black's Organic Chocolate Bar, Dark 70% Cocoa. I personally love the taste of dark chocolate and like the bars with an even higher content of dark cocoa. But for those of you who prefer milk chocolate to dark chocolate, you can start adjusting to dark chocolate by starting with chocolate bars that have a lower cacao powder content and gradually move to bars with more cacao. You won't benefit from antioxidants in chocolate if you eat chocolate with milk. So don't eat your dark chocolate with a glass of cold milk - the milk interferes with absorption. "Eating a little bit of chocolate or having a drink of hot cocoa as part of a regular diet is probably good for personal health, so long as people don't eat too much of it, and too much of the kind with lots of butter and sugar," said Diane Becker, the lead researcher of an 18 month study at Johns Hopkins in Baltimore. 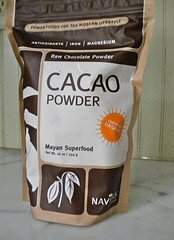 I became interested in organic cacao powder after reading Superfoods: The Food and Medicine of the Future. Cacao beans are listed as one of the top 10 superfoods by David Wolfe. I was quite excited to learn about this as I am a big fan of chocolate. In case you didn't know all chocolate comes from the cacao bean or also known as the cocoa bean. This cocoa bean is actually the seed or nut inside the pod/fruit. According to David Wolfe, "the raw cacao bean is one of nature's most fantastic superfoods due to its mineral content and wide array of unique properties." By weight cacao has more antioxidants than red wine, blueberries, acai, pomegranates and goji berries combined." The benefits of cocoa may surprise you as they did me. The cocoa bean is actually the seed or nut inside the pod/fruit. According to David Wolfe, "the raw cacao bean is one of nature's most fantastic superfoods due to its mineral content and wide array of unique properties." However, the many benefits of this bean are destroyed by cooking, refining, and processing. First consider their antioxidant power. Natural cocoa powders, such as Healthworks Raw Certified Organic Cacao Powder contain the highest amount of total antioxidant capacity. 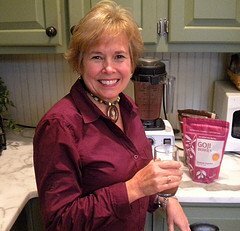 I put the cacao powder in smoothies using almond milk and antioxidant rich berries. Makes enough to serve 4-6 superheroes or superheroines! 1-3 cups organic berries (depending on how thick you want your smoothie) We use frozen blueberries and raspberries harvested from our back yard.